ASSALAM O ALAIKUM tamam Musalman bhaio. ALLAH aap sbko dono jahano mein kamyabi de. Bhaio main is forum pe new hun aur mujhe itni ziada deeni knowledge bi nai hai. Aap logon se madad ki iltija hai. 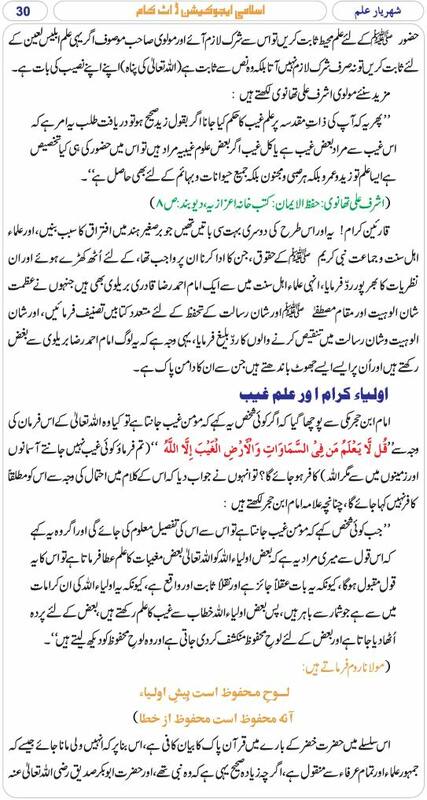 Ilm e ghaib se mutaliq pehle hi is forum pe bohat si posts hain isi lye agr mera sawal repeat ho chuka ho to maafi chahta hun, plz mujhe link de den main ye topic delete kr dunga. 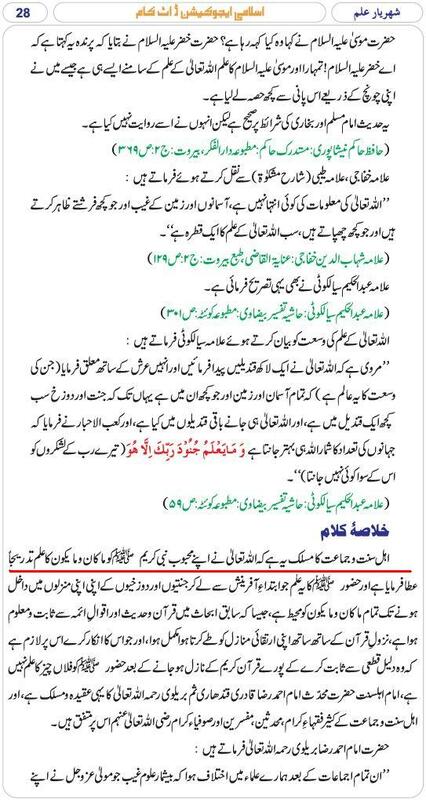 Mujhe aik deobandi ne ilm e ghaib ki behas mein ye kaha hai k "MAA KANA WA MAYAKOON" ka ilm sirf ALLAH ki zaat e pak k sath hai aur kisi k sath nai. Mujhe "MAA KANA WA MAYAKOON" ka mafhoom bta den aur is aiteraz ka jawab bi de den. ALLAH aap logon k ilm o amal mein barkat ata frmaye. JAZAKALLAH. Saeedi sahab k kya kehne. ALLAH unka saya hmare saron pe salamat rkhe. Aur Toheedi bhai aapka bi bohat bohat shukriya. ALLAH aapko jazaye khair de. 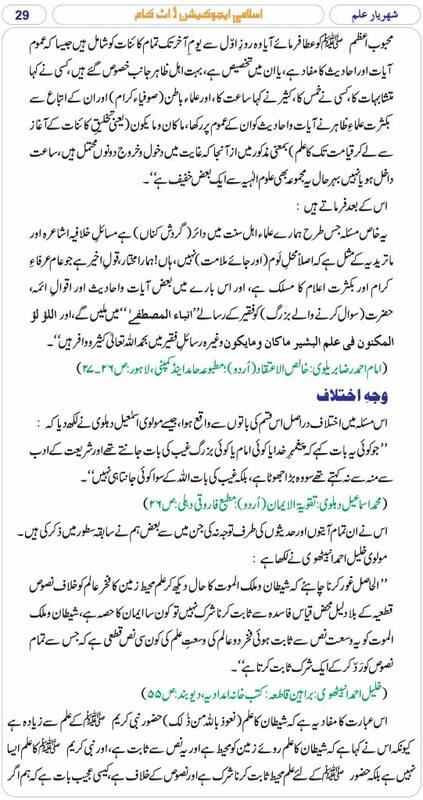 Muslims believe Prophet (sallallahu alayhi wa aalihi was’sallam) has been sent as a Shahid/Shaheed in meaning of hearing/seeing type of witness. The opponents of Islam reject and argue against this belief on account that witnessing does not require him to be first hand witness. Rather Prophet (sallallahu alayhi wa aalihi was’sallam) can bear witness without being an actual witness. They believe Prophet (sallallahu alayhi wa aalihi was’sallam) will bear witness on judgment day upon being informed by members of his Ummah. To substantiate their position they quote various evidences which indicate person/people bearing witness without having to see/hear anything of the event. This short article, if Allah (subhanahu wa ta’ala) wills, will expose the error of their methodology and in-appropriateness of their evidence. There are two types of events to which a Muslim can bear witness, the external and the internal. External witnessing involves sight/sound and it involves an event being heard/seen by an individual. And then this individual bears witness in court recollecting from memory what was seen and heard. The second type, the internal, witnessing is based on knowledge. Knowledge derived from senses, other then eye/ear, without external event, which involves ability of self assessment and then declaration of what was found internally. First type of witnessing - or external – involves yourself/another, and always involves an event unfolding, visually/audibly, which you/another can see/hear. This type of witnessing requires being first hand witness to bear truthful witness in court of law and in this context the greatest court of law, aka judgment day. And it is connected with crime/sin and punishment aspect of law of Allah (subhanahu wa ta’ala). And the one who does not meet this criterion is not truthful witness. The second type - internal - witnessing involves no audible/visual event, nor it involves another person, it is strictly about one’s oneself. And the type of witnessing involves personal belief to which none can be witness with their eyes/ears. The one who can bear witness about his own belief/faith is the person’s self. Abdul Wahid cannot bear witness about the true state of belief of Abdullah. He can bear witness to what Abdullah declares. The true knowledge of belief/faith of Abdullah, only Allah (subhanahu wa ta’ala) and Abdullah know. The internal type of witnessing is for declaring personal belief, and it cannot be used, and is not used in criminal trials. Prophet (sallallahu alayhi wa aalihi was’sallam) will bear witness regarding the actions of his Ummah and the actions of previous nations on judgment day as established in the Quran and Ahadith. And as per rule the type of witness required is - external witness - one who is has heard/seen the events as a first hand witness. Any witnessing of - internal witness – is not acceptable because individual/people are bearing witness about their personal beliefs/convictions which they have. In Islam there are two types of witnessing’s, a type which is related to court, crime, and punishment. And this witnessing requires one bearing witness about actions/events does so after audibly or visually witnessing the details of events. In context of court - bearing witness when person has not seen/heard the events, but has bore witness after being informed by another, such a person is not truthful witness. One who bears witness of his inner belief/faith, does so based on the first hand knowledge, which none can have other than the person, making the statement. And such witnessing is not and was never binding in court. The required type of witnessing for ciminal activity and for punishment is first hand witnessing.